I've had issues that dragged me to the doctor's office the last couple of weeks. Sitting and waiting is something that I've come to enjoy on occasion. I use the opportunity to ponder things better left unpondered. The doctor's office though is a different matter altogether. While never actually diagnosed, I have as far as I'm concerned, a mild case of OCD. The entire place seems designed to exploit this fact. My mind will run over these every time, determined to make sense out of the seemingly random letters and shapes. But it never makes any sense. Again, no pattern. No sense of symmetry. Nothing but a few colors almost creating balance. It's the fact that they're always a tile or two off from working that drives me mad. You can't really tell, but the eyes are blue. 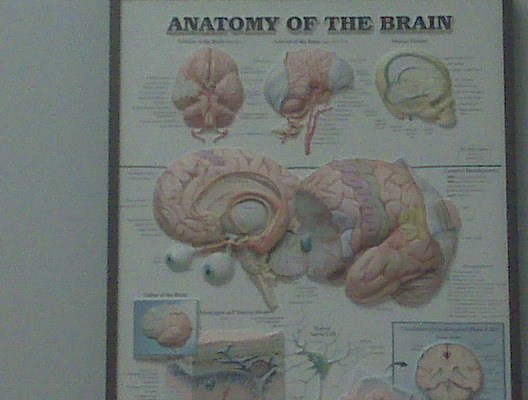 Clearly my brain doesn't look anything like that as I have brown eyes. 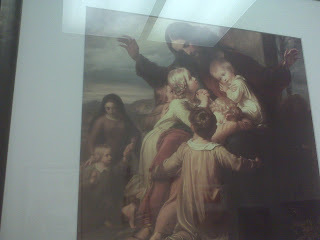 Whoever painted this was obviously given the task of creating a scene to represent "suffer little children to come unto me." However it looks like Jesus is telling a a monster story. Look at the way the arms are raised up like he's doing a fatherly bear growl. Also note the one child seems to be crying into his lap. Apparently he was frightened by the story. I would entitle the painting, "Christ reciting the story of Godzilla." Hey I maybe Christian, but that doesn't mean I can't appreciate how bad a piece of art it is. 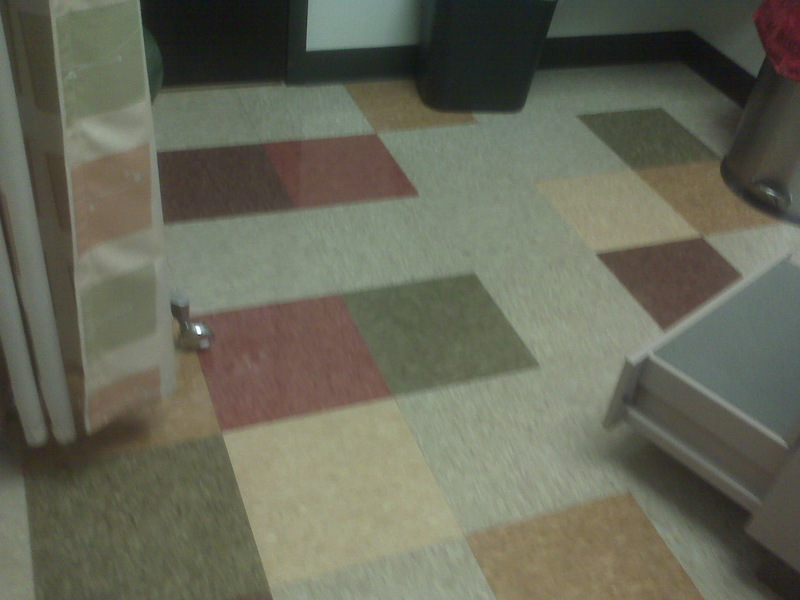 That doctors office looks like it fell out of the 70's a little bit. And I totally agree about the Jesus picture. It looks like he's doing scary monster hands. The fact that your doctors office has a Jesus picture to begin with fascinates me. Mine just has posters about fetuses and osteoporosis. I work at a doctors office. Our chairs look very very similar! I hear ya on the OCD thing. That sort of almost-pattern-but-not-quite thing has always thrown me. And germs, of course. Eep! Jesus had to get their attention somehow. The fact that he was Jesus probably wasn't enough. Just count me one among many of the infinite thunder. It's an honor, I'm sure. I tell ya, you are just like me! You took these pictures with you cell camera I bet. I do the SAME THING! I take random shots of stuff, and I always take a shot of those cool medical charts and posters! If I didn't have any real problems before entering that exam room, I would have a list of them after staring at that floor for five minutes. Just the photo of it is driving me a little loopy. There is a picture of Jesus in your doctor's office?! That's insane. Isn't it? I think it is. Love the fact you had your camera and were shooting these for your blog. I agree with your interpretation of the Jesus picture. I'm giving you a task. Count how many times the letter "A" appears in those chairs. I am OCD and those chairs and tiles in your doctor's office would kill me I would probably stop going. LOL. This waiting room needs to come with a "may cause seizures" warning. 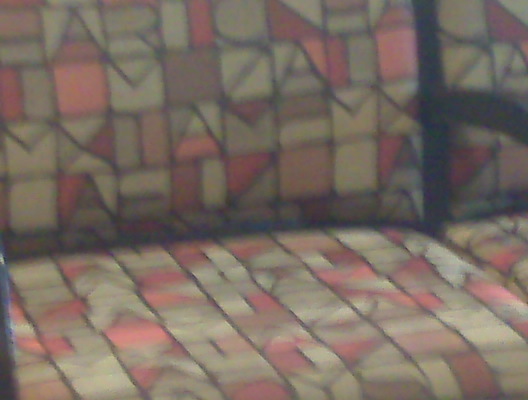 My head is spinning from looking at that couch. In other news, cherries are pretty tasty. Oh man - the painting stuff cracked me up. Wait a minute..... Jesus in a doctor's office? Did he touch your hear, making you fall backwards, only to stand up completely healed and pain free? Memories, like the corner of my mind. Misty water-colored memories of the way we were. This post was my initiation to The Non-Review.